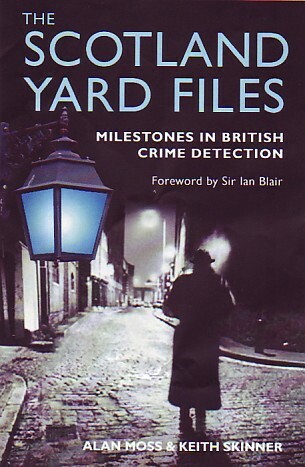 A series of murders in 1888 - 1891 in London's East End were investigated with increasing urgency by Scotland Yard. The murder victims were all women, and were linked by gruesome disfigurement by the perpetrator, who was never identified. The murderer became known as Jack the Ripper because of a letter sent to Scotland Yard, apparently by the murderer. The identity of Jack the Ripper has been a mystery ever since. It is worth reflecting how much modern investigation techniques and forensic science have advanced since those days, but murders by a stranger committed in public places out of the sight of witnesses are still difficult to solve today. The first three of these suspects were nominated by Sir Melville Macnaghten, second in command of the Criminal Investigation Department (C.I.D.) at Scotland Yard in June 1889. 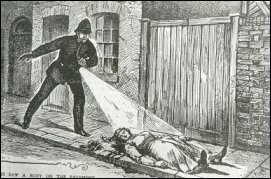 They were named in a report dated 23 February 1894, although there is no evidence of contemporary police suspicion against the three at the time of the murders. Indeed, Macnaghten's report contains several odd factual errors. Kosminski was certainly suspected by the head of the C.I.D. Dr. Robert Anderson, and the officer in charge of the case, Chief Inspector Donald Swanson. Druitt appears to have been Macnaghten's preferred candidate, whilst the fact that Ostrog was arrested and imprisoned before the report was compiled leaves the historian puzzling why he was included as a viable suspect. 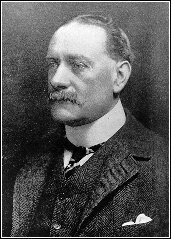 The fourth suspect, Tumblety, was stated to have been "amongst the suspects" at the time of the murders and "to my mind a very likely one," by the ex-head of the Special Branch at Scotland Yard in 1888, ex-Detective Chief Inspector John George Littlechild. He confided his thoughts in a letter dated 23 September, 1913, to the criminological journalist and author George R Sims. Saturday 8 September 1888 Annie Chapman Rear Yard at 29 Hanbury Street, Spitalfields. Tabram having gained favour more recently as a possible sixth in the opinion of some historians. The murders were considered too complex for the local Whitechapel (H) Division C.I.D, headed by Detective Inspector Edmund Reid, to handle alone. Assistance was sent from the Central Office at Scotland Yard, after the Nichols murder, in the persons of Detective Inspectors, Frederick George Abberline, Henry Moore, and Walter Andrews, together with a team of subordinate officers. Reinforcements were drafted into the area to supplement the local men. After the Eddowes murder the City Police, under Detective Inspector James McWilliam, were also engaged on the hunt for the killer. Every one of these murders remained unsolved. No person was ever convicted of any of them. Certainly the evidence indicates that Smith was murdered by a group of three young hoodlums. The police investigated a suspicion that Tabram was murdered by a soldier. Mylett, who was not even murdered according to Assistant Commissioner Robert Anderson, was probably strangled by a client. McKenzie's wounds indicated yet a different killer. The 'Pinchin Street torso' was undoubtedly an exercise in the disposal of a body, and Coles was possibly murdered by a male companion, James Thomas Sadler, who was arrested and, certainly for a while, suspected of being the Ripper. A popular image of the killer as a 'shabby genteel' man in dark clothing, slouch hat and carrying a shiny black bag was also beginning to gain currency. The press, especially the nascent tabloid papers, were having a field day. With no Whitechapel murders in October there was still plenty to write about. There were dozens of arrests of suspects "on suspicion" (usually followed by quick release); there was a police house-to-house search, handbills were circulated, and Vigilance Committee members and private detectives flooded the streets. The discovery of a female torso in the cellars of the new police headquarters under construction at Whitehall (the Norman Shaw building) added to the air of horror on 2 October, 1888. 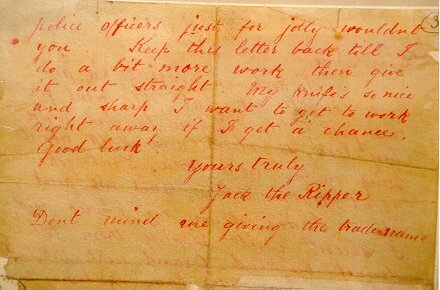 The floodgates to a deluge of copy cat 'Jack the Ripper' letters were opened, and added to the problems of the police. Well-attended and lengthy inquests were held by Coroner Wynne Baxter on the majority of the victims. By the time the murders came to an end in 1891, the proprietors of the Working Lads' Institute had had enough of the noisy, unruly, proceedings and informed Baxter that he should find a different venue for his next inquest. A number of relevant files and documents are available in the National Archives at Ruskin Avenue, Kew. Look out for a summary of the Whitechapel Murders in our own book, published by the National Archives in August 2006, The Scotland Yard Files . Also Jack the Ripper - Scotland Yard Investigates by Stewart P Evans and Donald Rumbelow.